Builder's Engineer: Manufactured Foundation Drainage System Installation. Manufactured Foundation Drainage System Installation. 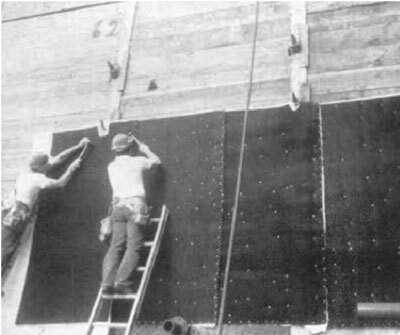 Material is generally supplied in rolls that is simply applied to the waterproofed walls by using double-sided masking tape, sealant, or other adhesives recommended by the waterproofing membrane manufacturer; see installation photograph, Fig. 2.10. The material is installed like roofing shingles, overlapping in the direction of water flow, starting with the lower portion first, lapping higher elevation goods over the already installed piece to match the manufacturer-supplied flange edges (Fig. 2.11). Drainage systems can also be applied directly to lagging prior to concrete placement (Fig. 2.12). terminating edge of waterproofing membrane. FIGURE 2.11 Application of drainage system. The filter fabric material is always applied facing out, and manufacturers provide additional fabric at ends to overlap all seams. 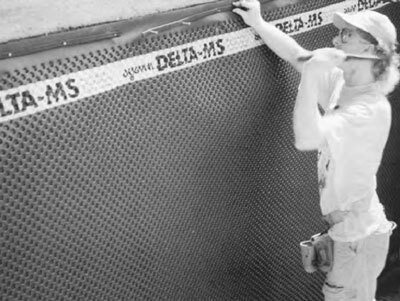 The terminated ends of the material are covered with the fabric by tucking it behind the plastic core sheet. 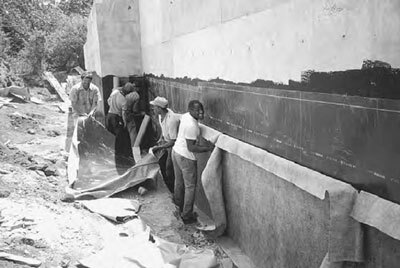 Side edges of the sheet are typically attached together by overlapping and applying an adhesive. Figure 2.13 shows a partially completed drainage system installed with appropriate drain field gravel backfill. Figure 2.14 details the use of drainage systems for under-slab drainage. Figure 2.15 details the use of these systems for horizontal transitioning to vertical drainage at a below-grade tunnel installation. 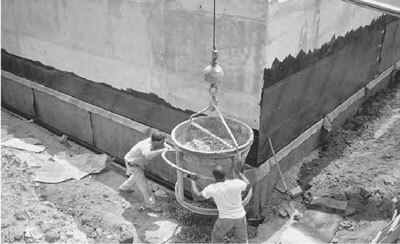 Backfilling should take place as soon as possible after installation; using the available site soil is acceptable. Backfill should be compacted as required by specifications using plate vibratory compactors. Caution should be taken during compaction not to damage the fabric material. FIGURE 2.14 Manufactured drainage system used for below-slab drainage.